Every cell in your body is enclosed by a cell membrane, a lipid bilayer that separates the cell’s contents from its surroundings. Residing within the cell membrane itself, molecules move around like ballet dancers on a stage. Taka-aki Tsunoyama sits at the microscope cockpit, where he controls the single-molecule imaging station and observes protein ballet. In order to understand how these proteins move within the membrane and how they interact with each other, Prof. Kusumi and other researchers developed an imaging method for live cells called live-cell single fluorescent-molecule imaging (SFMI). In SFMI, each protein ‘dancer’ in the membrane is individually tagged with fluorescent markers to make them visible under special home-built fluorescence microscopes. 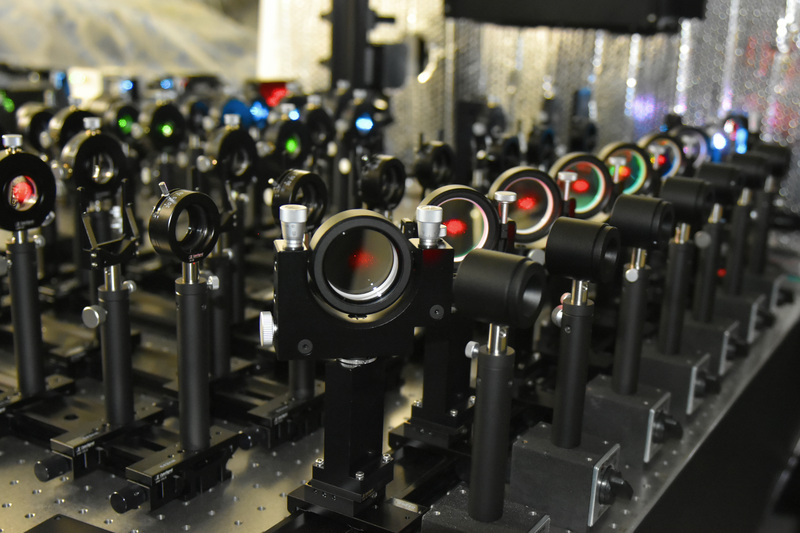 The microscope built by the Membrane Cooperativity Unit for live-cell single fluorescent-molecule imaging. However, SFMI can be problematic: — over time under the microscope, fluorescent markers lose their glow – a process known as ‘photobleaching’. Because of this, until now, cell biologists have been unable to observe individual molecules for longer than about ten seconds at a time. 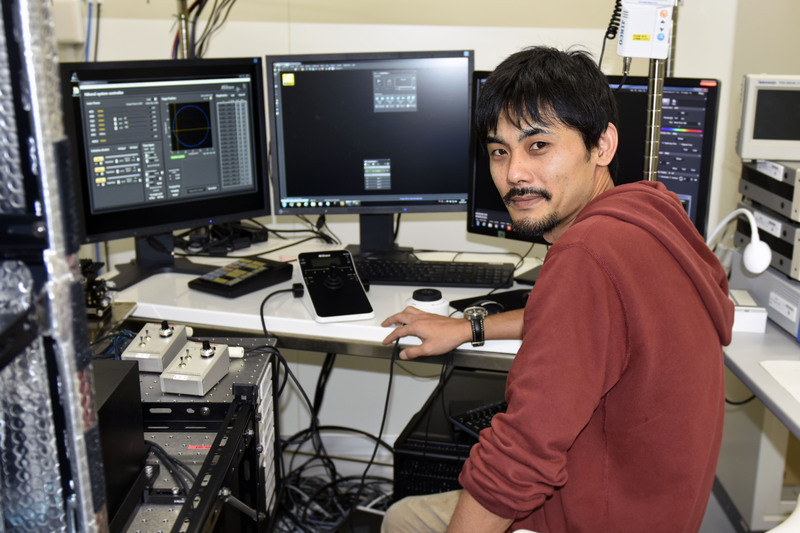 “It was like randomly taking many 10-second long clips, and trying to connect them in the correct order to produce a movie lasting for 5 minutes,” says Mr Taka-aki Tsunoyama, a researcher from the Membrane Cooperativity Unit at OIST. Previous methods used to prevent photobleaching were not very effective, and in addition, they were usually toxic to living cells, like totally removing molecular oxygen. However, the OIST researchers placed the cells in an environment with low oxygen concentrations, which mimics the real conditions inside a living organism, and added two mild chemicals called ‘trolox’ and ‘trolox quinone’. This combination was amazingly effective at reducing photobleaching without influencing the viability of the cells. This new approach allows the researchers to observe individual molecules in living cells for up to 400 seconds. “Our method improves the observation time of fluorescent molecules by forty-fold,” says Prof. Kusumi. At time 0, the numbers of fluorescent molecules are about the same in both movies. The number decreases rapidly in the video on the left which employed a conventional observation method, whereas the number of fluorescent spots decreases very slowly in the video shown on the right, which was recorded using the newly developed method. See the spots jostle around in the cell membrane. With the increased time window of observation, the researchers were able to study how molecules work in the cell far more directly and clearly. They studied specific regions of the membrane known as focal adhesions. “These are effectively the feet of the cell,” says Prof. Kusumi. The cell uses these ‘feet’ to get around, for instance, when cancer cells metastasize. A schematic showing the organization of proteins at a focal adhesion. Integrins link the internal skeleton of the cell (the elongated beaded-cord-like structure in black and white) to molecules in the extracellular matrix (green twisted-ribbon-like structure). Using their new technique, the researchers can record videos of entire acts of protein dances in the cell membrane, without interruption. “With our method, we can now follow the movement of each individual molecular dancer for sufficiently long periods of time to understand the cellular context” says Prof. Kusumi. Shedding light on the behavior of focal adhesion proteins could help researchers one day develop drugs that stop cancer cells from migrating through the body, he says.